For this recipe, I used nuts and oatmeal to get a hearty texture. The frozen banana cream, as a substitute for vanilla ice cream is suitable especially for vegans (yes, there are many of them in the German capital). Topped with the frozen treat and some maple syrup this dish is absolute heaven. Core and chop the apples into small pieces. Put them together with some lemon juice and nuts into a baking dish. Top with maple sirup and some of the cinnamon, set aside. Place oatmeal, flour, salt and brown sugar into a bowl. Then cut butter into small pieces and use your hands to mix it with the oatmeal, until you have a nice crumbly texture. Sprinkle the crumbles on top of the prepared apples, then place into the preheated oven. Bake for about 30 minutes, until the crumbles start to turn golden and the apples are bubbling through. Simply blend the frozen bananas in a food processor. In the beginning it will look like it’s not getting smooth, but just keep on blending, it will turn out in an ice-cream like consistency. 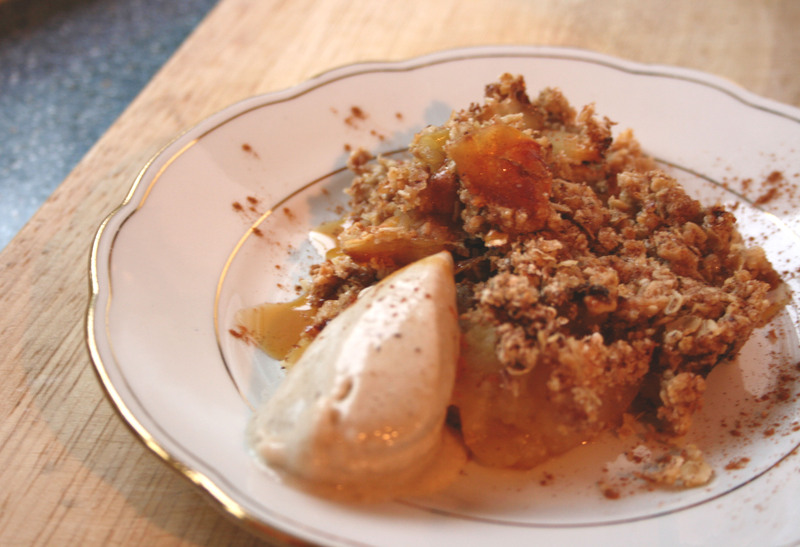 Serve the warm Apple Crumble with banana icecream and maple sirup ( lazy option: vanilla icecream).